EA Image Comparison lets your viewers easily compare between two images. This is a great way to put a new product and an old product side by side and let visitors see the difference. To use this Essential Addons element, find the ‘EA Image Comparison‘ element from the Search option under the ‘ELEMENTS‘ tab. Simply just Drag & Drop the ‘EA Image Comparison’ into the ‘Drag widget here‘ or the ‘+’ section. From the ‘Images’ section, you can upload your prefered Before & After Images, modify the label and add an alter tag for the images. From the ‘Settings’ section, you can increase or decrease the ‘Original Image Visibility’. Besides, you can use the drop-down menu to change the ‘Orientation’ from out of these two: Horizontal & Vertical. By default, it is set to ‘Horizontal’. You can turn on or off the toggle to change ‘Overlay’, ‘Move Slider on Hover’ and ‘Move Slider on Click’ settings. Switch to the ‘Style’ tab to style all the features of Image Comparison. From the ‘Image Container Styles’ section, you can use the toggle to enable or disable the ‘Max Width for the Container’. You also have the option to add Border & style it. You can also add styling to ‘Handle’, ‘Divider’ & ‘Label’ by changing the color, typography & many more as per your preference. By following the basic steps and a bit more modifying, you can style your Image Comparison as per your preference. 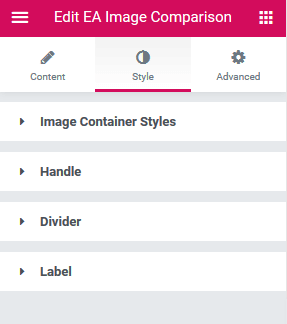 This is how you can easily create a comparison layout for images to showcase on your website using EA Image Comparison.